This is no surprise that Microsoft wants you to install Windows 10. But, Hey Microsoft, Not everyone wants to upgrade to Windows 10. Many people are happy with Windows 7 or Windows 8.1 OS and don’t want to switch to the newest Windows 10 operating system. Days after the launch of Windows 10, Microsoft started offering Free Windows 10 installation to every Windows user. The marketing strategy successfully worked for Microsoft and just within a week after the launch, Windows 10 started running on millions of PCs. Then the company went into planning other tricks in order to get on to the maximum number of PCs as possible. It silently started pushing Windows 10 installation files on PCs running Windows 7 or Windows 8.1, even if users have not opted into the upgrade. Less than two months ago, some Windows 7 and 8.1 users also claimed that Windows 10 had begun to install itself automatically on their PCs, which Microsoft later called it a mistake. 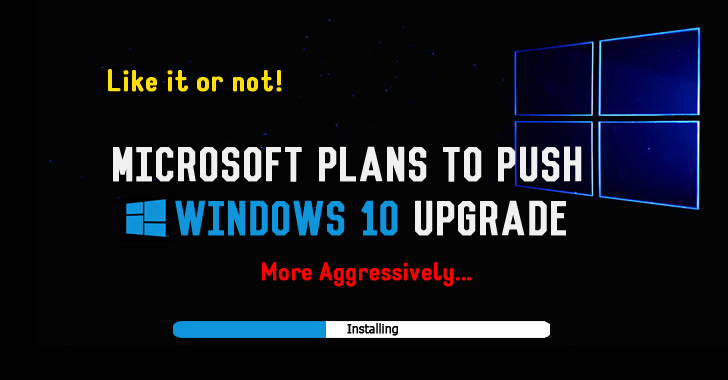 Now, Microsoft is going to kick off a more aggressive Windows 10 Upgrade strategy. The new operating system that showed up first as optional, and then as recommended download in Windows Update, will soon show up – "Yes, I want to upgrade." Yes, those Windows 7 or 8.1 users who are trying to block the Windows 10 upgrade will find that the upgrade has just not gone away. Must Read: Just Like Windows 10, Windows 7 and 8 Also Spy on You – Here's How to Stop Them. This is because Microsoft has recently made some changes to settings on Windows 7 and 8.1 machines that were previously configured not to receive the Windows 10 upgrade. The settings have been reset in such a way that one of the updates that the company deployed on Windows 7 and Windows 8.1 machines keeps on checking every day to make sure that no other changes are made to this behavior. The issue was reported by Josh Mayfield, the creator of GWX Control Panel, an app used to block the upgrade to Windows 10. The developer received several reports from its users who specified that their preferences of not upgrading to Windows 10 reset up to several times a day and the Windows 10 update presented to them again. "Over Thanksgiving weekend I started getting reports that the Windows Update 'AllowOSUpgrade' setting was getting flipped back on on a number of peoples' PCs, and it keeps resetting itself at least once a day if they switch it back off," Josh Mayfield said as reported by Computerworld. Microsoft stated about a month ago that it intends to push the new operating system much more aggressively in the new year, re-categorizing Windows 10 as a "Recommended Update" in its Windows Update service. So don’t be surprised if, in coming days, the Windows 10 installation process starts again, and again, until you finally lay down your arms and allow the Windows 10 upgrade, or simply move on to another operating system.